This group of 4 dvds and 1 audio cd and 1 book is for sale for $100.00 for all or individually or any combination thereof….. This performance goes over speeches and much sage advice from the 16th president of the United States of America. Lincoln’s Ghost Tells Stories-2014 dvd February 22, 2014 live show at the Opera House in St. George, Utah of Lincoln’s Ghost tells stories. New Storytelling CD is now available! “When The Roll Is Called Up Yonder” with a Davew. In 2006, I did an audio cassette of “Fanny Stories”, true experiences of my mother’s mother, Fanny Crawford Gifford. Just recently I did a story telling cd and included two of her stories. In one of them, she tells about the death of her little sister Laura Ann when Fanny was eight and of a 4 yr old brother, Joseph, who died at age four, when Fanny was 12. Fanny had learned to play the organ and often played “When the Roll Is Called Up Yonder” at Joseph’s request as it was his favorite song. He’d sing along when he was feeling well enough to. Fanny prayed that he’d be healed if possible and felt a warm comforting feeling that all would be well. when Joseph died the next morning, she knew that all was well. When the Roll Is Called Up Yonder is an 1893 hymn with words and music by James Milton Black. The song was inspired by the idea of The Book of Life mentioned in the Bible, and by the absence of a child in Black’s Sunday school class when the attendance was taken. The idea of someone’s being not in attendance in heaven haunted Black, and after visiting the child’s home and calling on a doctor to attend her for pneumonia, he went home and wrote the song after not finding one on a similar topic in his hymn collection. The song’s lyrics were first published in a collection titled Songs of the Soul and the song has since been translated into at least 14 languages and sung all over the world in a variety of Christian denominations. The story as told by Fanny is in the description. On the cd are Fanny’s stories, Jacob Hamblin and Brigham Young as I tell their stories in St. George Live, Denzil Hall, and other story tellers I have known, my take and Abraham Lincoln’s take on storytelling, and I’m adding “The Ugliest Man In Washington County, Utah” to future editions. The ten original cds are gone and the new ones will be ready in days. I’ll try to explain the differentness and uniqueness of each show. a great orator and finally the President of the United States? What made him so special and that all possible? St. George Pioneer Opera House. 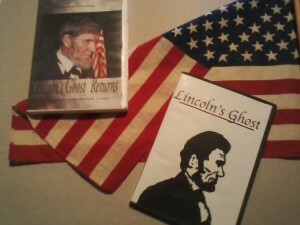 In this presentation, Lincoln’s Ghost gives and overview of the life of Abe Lincoln. much sage advise from the 16th president of the United States of America. presented his one man show Lincoln’s Ghost Returns. opinions on what makes for good government. October of 2010, Ghost Tours in Santa Clara, Utah featured Lincoln’s Ghost. He told about his experiences with deaths in his life, some of it in verse. house which was an expansion of the short five minutes Ghost Tours talk. and family members and others, and how these happenings affected him. He also had fun with poetry. One fine example is “The Wild Bear Chase” written by him. 16th President and how he used stories. Lincoln’s Ghost told wonderful stories on Feb. 22, 2014 at the Opera House in St. George, Utah. Lincoln played which musical instruments? Learn things you never knew about the 16th President of the USA. Laugh and cry and be intrigued by a murder mystery written by Abe. So you see, If you have bought one, you haven’t heard them all. The firsts 3 are on video and the 2014 is on Audio cd. On You Tube, one can see all of the 2009 show. And one can find promo videos for the 2010 and 2011 shows. Learn some things you never knew about Abraham Lincoln. Was he in a duel? Laugh and cry and be intrigued by mystery. February 22, 2014 an Audio Cd of the show is now available for sale. April 15, 2014 a Video DVD is now available for sale. Tickets are available at the St. George Art Museum, 47 E. 200 N prior to, at the door or by calling 435-627-4510 Limited seating. Hear It on Audio CD. Lincoln’s Ghost told wonderful stories on Feb. 22, 2014 at the Opera House. Audio Cd of the show is now available for sale. Who’s the ugliest guy in your County? I want to thank The Country Magazine and the author (Harold Callahan) of “The Ugliest Man in Leslie County Kentucky for the inspiration for my tale of “The Ugliest man in Washington County Utah”. The article appeared in the 1993 March/April edition. Mr. Callahan’s story is short but very funny. You need to find it and read it. There are similarities in my story but as you will discover its much different. And the guy in Leslie County may be uglier. Sales Person: Step right up, Step right up and see the ugliest man on the planet for a fee of just 25 cents! Last Scout: i bet he’s not that ugly,” walks up, takes neckerchief of of ugly man, and then the ugly man faints making the last customer the ugliest man.